YouTube has made a couple of interesting tweaks to its offerings this week. Today we headline with the news that it is chasing more dollars with the doubling up of pre-roll video advertising. Other YouTube news this week centres around a new ad-supported free movies section, and the ad-less sharing of The Lego Movie - which in itself functions as an ad for the upcoming sequel. According to a report published by AdAge, YouTube viewers are starting to see two adds in a row ahead of the videos they have clicked to watch. 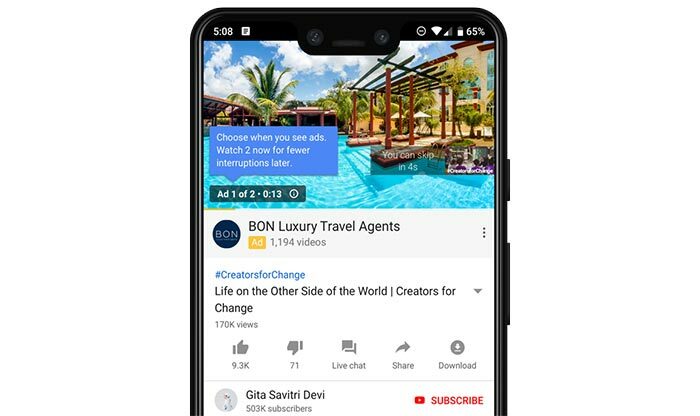 YouTube's new 'ad pods' have been designed to group together ads like this due to feedback indicating that watchers prefer to be interrupted fewer times. Thus if a video previously had 1 pre-roll ad and three ad breaks it can now have just one break in the middle, for example. AdAge talked to Debbie Weinstein, VP of YouTube and video global solutions, who claimed that "YouTube continues to innovate and think about how we can make the ad experience as good as possible for the user." The site still has to make money for its own operation and for advertisers and creators and it has found that users "really like" the difference delivered by the new 'ad pods'. However, at least one analyst thought the move was folly. Jim Nail, an analyst with Forrester research, highlighted the fact that viewers are flocking away from traditional TV but YouTube appears to be copying its ad model. The report on the ad pods format says it will start on desktops but expand to mobile and connected TVs next year. YouTube is expected to raise $3.4 billion in ad revenue in the U.S. in 2018, according to recent third party research, that would be an increase of 17 per cent from 2017. 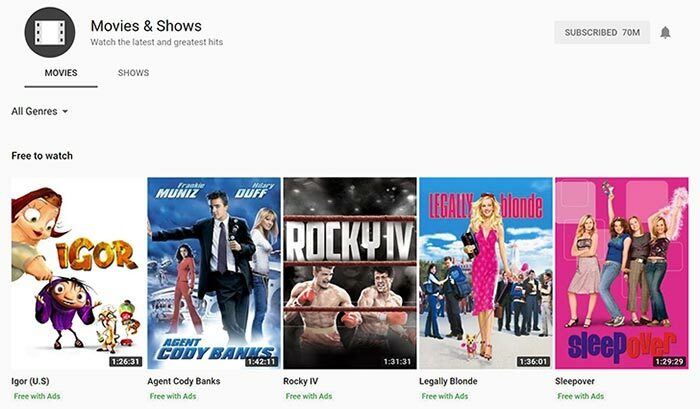 YouTube has started to list free to watch movies in the US, reports The Independent. Over at the YouTube Movies channel US viewers will be able to pick from a mixed bag of titles that are ad-supported. There are some major releases and well regarded obscurities among this first batch of titles. YouTube watchers will be able to see the likes of The Man in the Iron Mask, The Terminator, Rocky films, various Pink Panther films, and Legally Blonde - for free, for example. The Independent lists its favourites with descriptions and follows up with a simple full list of the rest of the movies. In a separate report we see YouTube and its partners trying a different tack. The Verge reports that a one-day promotional event will let users watch The Lego Movie in its entirety during Black Friday - with no commercial breaks. The event is to stir interest in the launch of The Lego Movie 2 — The Second Part which releases on 8th Feb. I've followed the instructions to watch The Lego Movie for free (via advert link in the official trailer for The Lego Movie 2) but it didn't work for me. Never mind. I use uBlock and have never seen a single ad. It is already happening, and it's really infuriating to be forced to see 2 adds in a row that you cannot skip. Especially when you are jumping from video to video and it happens on every single one. Glad I got YouTube premium, I have adblock, but also want to support those I watch regularly. edit: I forgot Tubi TV.